Price includes: Personalization and creating your file. Price does not include printing. I do all of the designing here on site! When you receive your personalized file it will be ready for you to take to your local printers to have it printed! 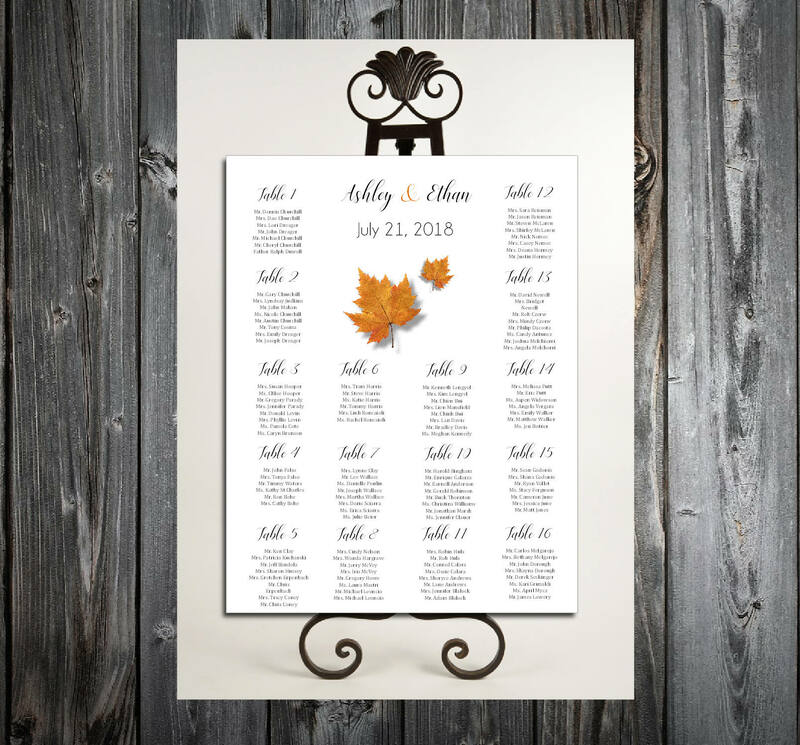 If you plan on putting your seating chart into a frame just let me know the inner dimensions of the frame so I can adjust your file so when it prints it will fit your frame. The color of the font and thin border can be changed. Pricing also includes unlimited changes! Files cannot be edited on your end. You must email me with any color choices,wording and/or changes and then the printable file will be emailed to you. If you receive the printable file and you need a change made that is ok....you can email me with the change and I will email you back an updated file. When submitting your changes please only email me the names/table numbers that need to be changed or added. Please do not resend your whole list. Once your file is correct and no other changes need to be made you will be able to take it to your local print shop to print. I make your file to size so your local printer won't need to resize it. The popular locations to take your file to be printed is either Office Depot or Kinkos. Most of the time they will have coupons for printing so be sure to ask them when you take them your file. The most popular way to mount the seating chart is on a foam board after it is printed. Most print shops will carry foam boards. 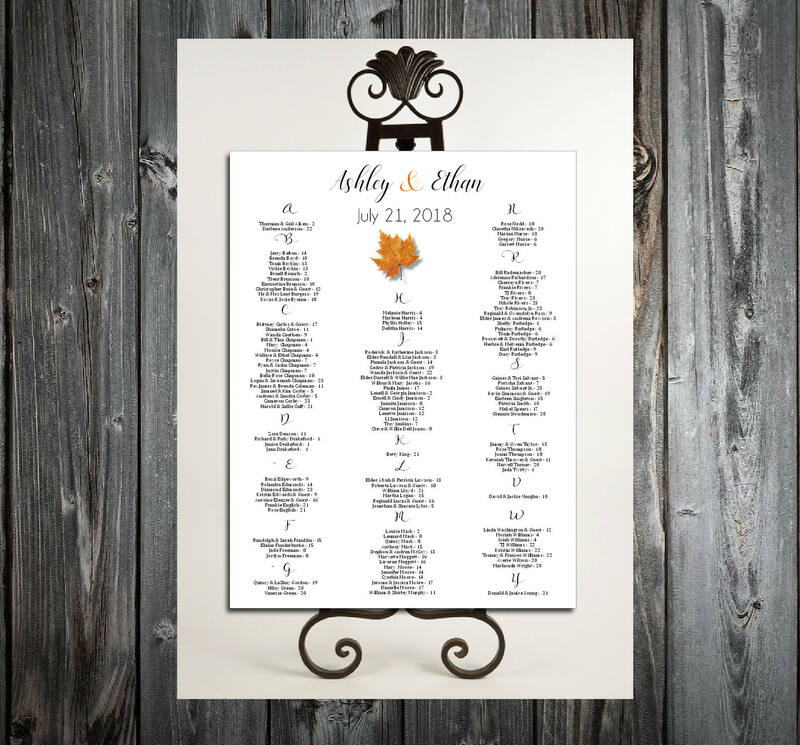 Please note that seating charts are the number one wedding item that has changes so with that in mind don't get your chart printed too soon or submit your list too soon. Even though you can have changes made, be sure to note that each email you send with changes can take 24-48 hours to be answered. So, if you find you are getting a lot of changes needed on your chart you might want to wait at least a few days before emailing me your changes so that the changes can be done in a timely manner. Having others look at your file to check for changes makes the proofing process go faster too. You can either submit your list alphabetically or by table number or table name.